Over the last 35ish years, I've entered something in nearly every non-livestock division of the county fair, with one notable exception: I'd never entered a collection. As I was looking through the entry guidebook back in the spring, I decided to finally tackle a collection. I'd recently come across my 4-H hat and about 10 lbs. 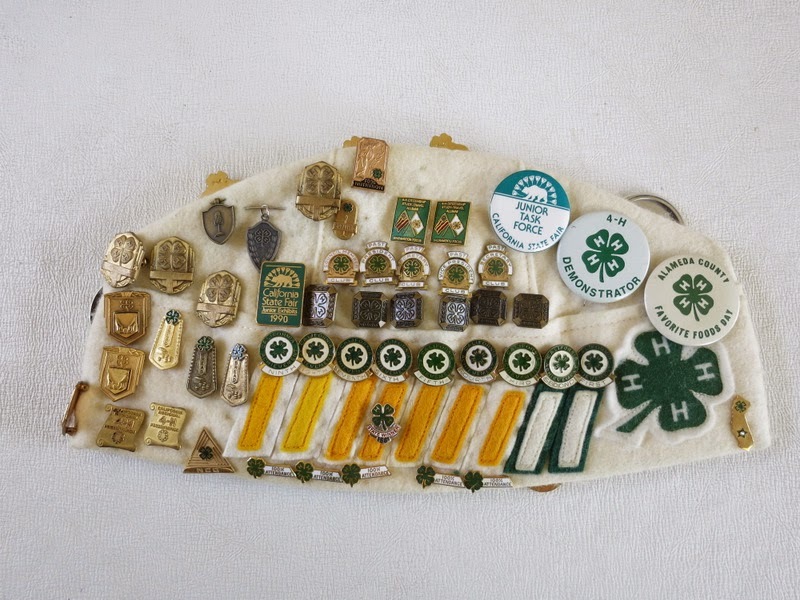 of trading trinkets that I'd received during my numerous trips as a State and National 4-H Ambassador. I thought they'd make a pretty interesting and unique collection display. 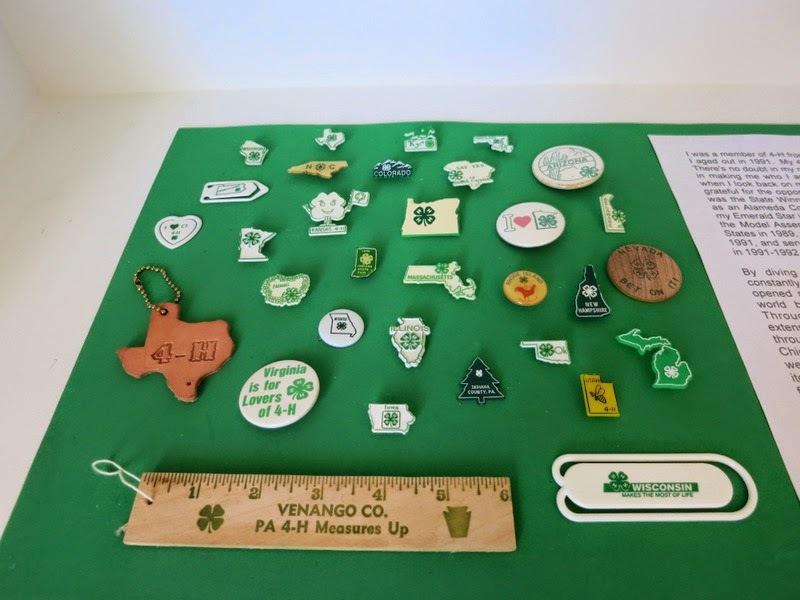 I started by going through all my trading trinkets and setting aside any pins, buttons, or other items with the 4-H emblem or name on them. I selected one from each state. It wasn't a complete collection of all 50 states, but it was close. Paired with my 4-H hat with all my awards on it, it looked pretty good. Most importantly, odds were very slim there would be another collection like it at the fair. It's not something you can just go out and buy. According to the entry guidebook, the collection display boxes were three different sizes: 1' x 3', 2' x 3', and 3' x 3'. The small size was perfect for my display. While I was working on my display, Trevor was working on his own display of his Perler Bead art. He too decided that the smallest size would work best for his collection. We measured out the exact size on our dining room table and practiced setting up our stuff. When the entry delivery day came, Trevor and I made sure to be the first ones there. The display cases were first come first served and we both wanted one of the small ones. I helped Trevor check in, then left him on the Youth side of the building setting up his collection. I headed over to the Adult side and started mine. It was immediately apparent something was very wrong. I'd cut green craft foam to exactly 1' x 3' to serve as the base for my display. It didn't fit AT ALL. Not even close. Turns out the alleged 1' x 3' display case was actually about 8" x 46". My base was too wide and too short. It looked terrible. Backing up, you can see that there's a lot of extra room in the case. That upper shelf is the alleged 1' x 3' space that I rejected. Hopefully whoever uses it didn't cut their base to size. 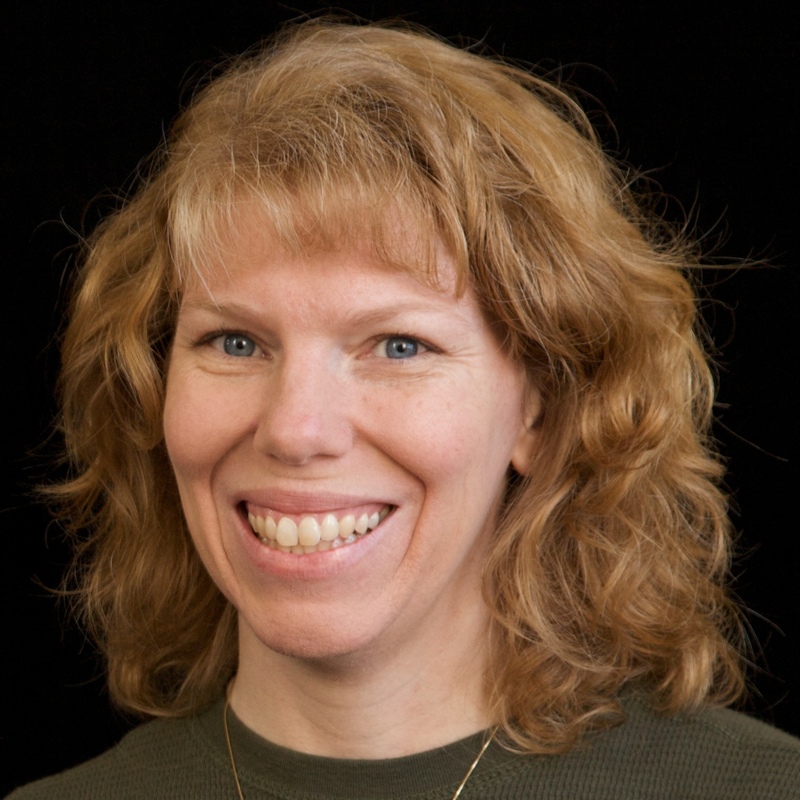 "I was a member of 4-H from 1983, when I was 11, until I aged out in 1991. My 4-H experience was amazing. 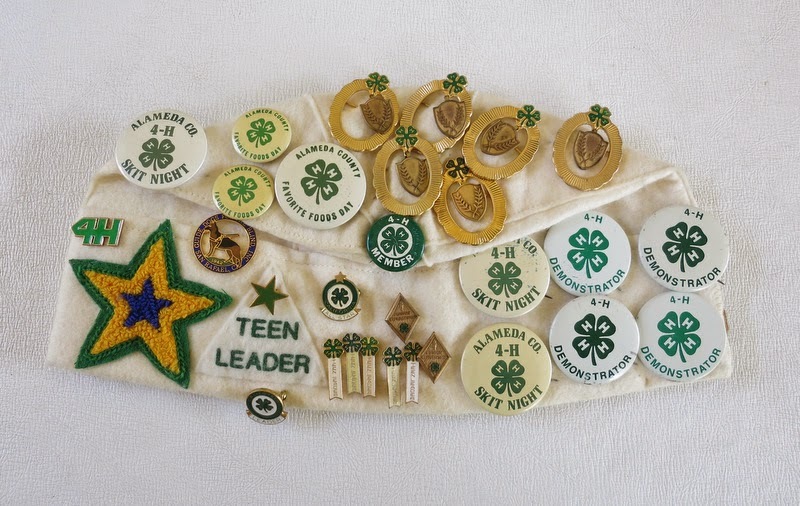 There's no doubt in my mind that 4-H was instrumental in making me who I am today. All these years later, when I look back on my 4-H career, I am so incredibly grateful for the opportunities and experiences I had. I was the State Winner in Breadbaking in 1988, served as an Alameda County All-Star in 1988-1989, earned my Emerald Star in 1989, represented California 4-H at the Model Assembly of the Organization of American States in 1989, was a California Diamond Star in 1990-1991, and served as California's National Ambassador in 1991-1992, just to name a few of the highlights. 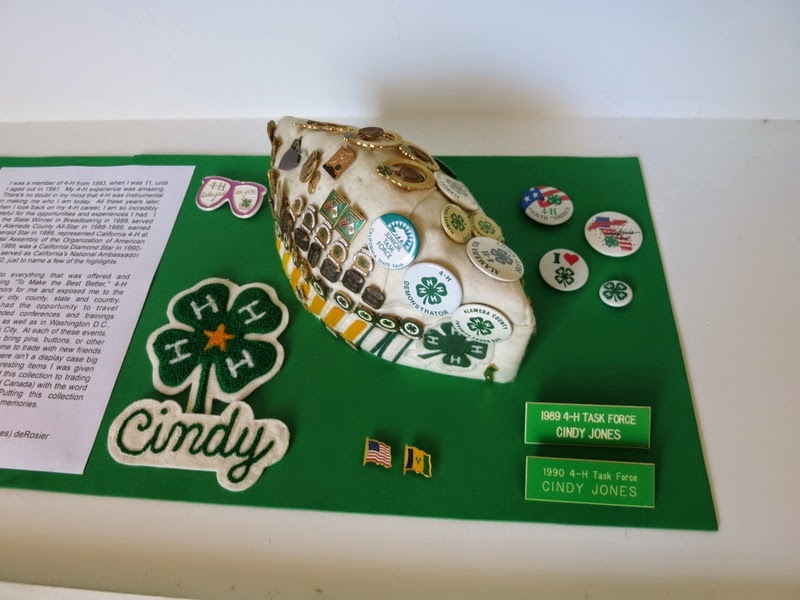 By diving into everything that was offered and constantly striving "To Make the Best Better," 4-H opened many doors for me and exposed me to the world beyond my city, county, state and country. Through 4-H, I had the opportunity to travel extensively. I attended conferences and trainings throughout California, as well as in Washington D.C., Chicago, and New York City. At each of these events, we were encouraged to bring pins, buttons, or other items representing our home to trade with new friends from around the world. There isn't a display case big enough to show all the interesting items I was given over the years, so I've limited this collection to trading items from different states (and Canada) with the word 4-H or a clover on them. Putting this collection together brought back many fond memories." Meanwhile, over in the Youth area, Trevor was having the same problem I had: his carefully planned display, measured to exactly fit the dimensions given in the entry guidebook, did not fit the actual space. He ended up moving his display to the medium-sized area also. 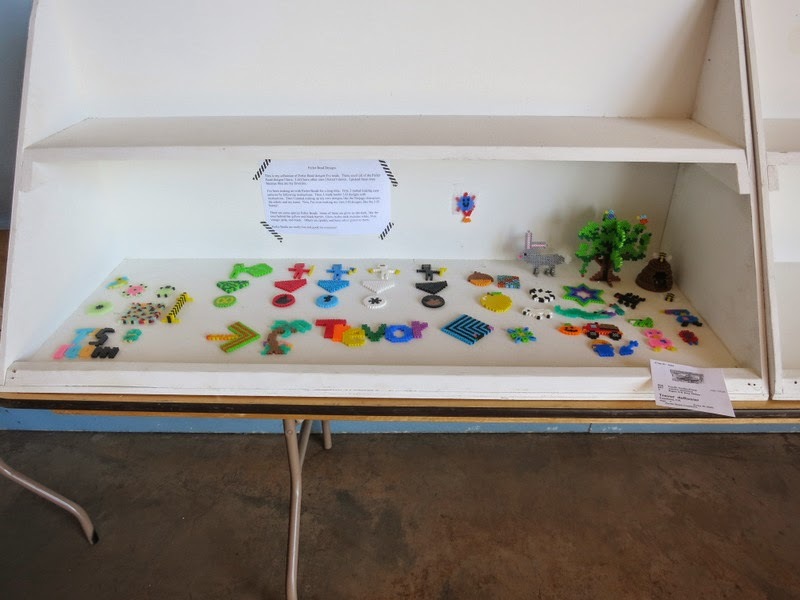 "This is my collection of Perler Bead designs I've made. These aren't all of the Perler Bead designs I have. I still have other ones I haven't shown. I picked these ones because they are my favorites. I've been making art with Perler Beads for a long time. First, I started making easy patterns by following instructions. Then, I made harder 3-D designs with instructions. Then I started making up my own designs, like the Ninjago characters, the robots and my name. Now, I'm even making my own 3-D designs, like the 3-D bunny!" The fair opens in a little over two weeks. We still have to make and deliver our baked goods, but all of our non-perishables are there already. Once the fair opens, I'll let you know how everything does! She did apologize, but there really wasn't anything she could do. If it's fixed in next year's guidebook, I'll know she actually listened and cared. If not, I'm going to be really irritated. Very cool that you tried something new and, in this case, have now entered in every competition of the county fair! Bummer the guidelines were incorrect...but your displays still look great! Not every competition (no livestock, no quilting, and a few others), but close! Love your collections! Good luck!